DIRECTIONS: From Georgetown KY, west on 460, right on Galloway Rd, tree lined driveway to house on left. Elegant country home w/1000 SF guest house on 5.52 acres. Surrounded on all sides by beautiful views. 3 bedrooms, 2 baths, hardwood floors throughout, kit w/ cherry cabinets + stainless appliances, bonus room, great room w/fireplace. 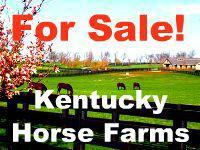 formal dining, deck, storage shed, chicken coop, 2 car garage and 3 paddocks. Entrance gates, portable paddock and run-in shed do not convey. Finding a new home has never been so easy!